Definition at line 914 of file InstrTypes.h. Definition at line 918 of file InstrTypes.h. 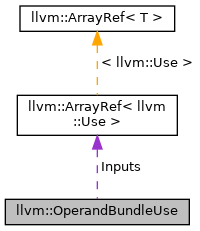 Operand bundle tags are interned by LLVMContextImpl::getOrInsertBundleTag, and this function returns the unique integer getOrInsertBundleTag associated the tag of this operand bundle to. Definition at line 942 of file InstrTypes.h. Referenced by CloneInstructionInExitBlock(), llvm::CallBase::getOperandBundle(), getSuccPad(), and llvm::InlineFunction(). Definition at line 933 of file InstrTypes.h. Referenced by llvm::CallBase::getOperandBundle(), and llvm::OperandBundleDefT< InputTy >::OperandBundleDefT(). Definition at line 947 of file InstrTypes.h. Definition at line 952 of file InstrTypes.h. Definition at line 923 of file InstrTypes.h. Definition at line 915 of file InstrTypes.h. Referenced by GetDeoptBundleOperands(), getSuccPad(), llvm::InlineFunction(), and llvm::OperandBundleDefT< InputTy >::OperandBundleDefT().